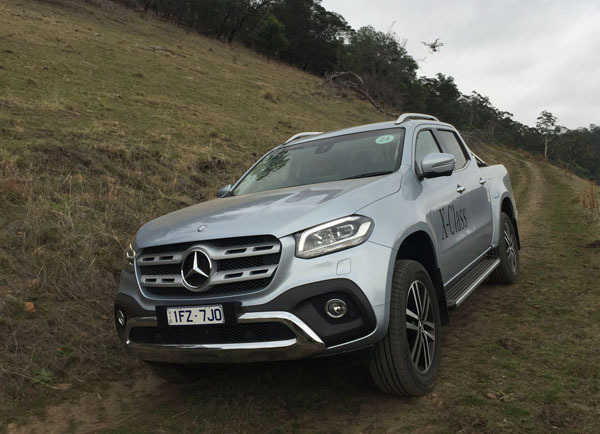 Mercedes-Benz has entered the pickup-truck market in Australia with a range of X-Class four-door models featuring two- or four-wheel drive and a variety of equipment levels. Though we tend to associate Mercedes with upmarket passenger cars the German company has long had a strong presence in commercial vehicles, with vans, buses of various sizes and large trucks. All X-Class models are powered by a 2.3-litre four-cylinder turbo-diesel engine that comes in in two formats; the Mercedes X 220 d has a single turbocharger with 120 kW and 403 Nm, the biturbo X 250 d has 140 kW and 450 Nm. The X 220 d is available with 2WD or 4WD. The X 250 d comes exclusively with 4WD. Both come with a six-speed manual gearbox. A seven-speed automatic is optional in the X 250 d.
A 190 kW V6 turbo-diesel engine will be introduced towards the end of 2018 and will be 4WD only, this time using the sophisticated Mercedes 7G-Tronic Plus automatic drivetrain. Though it’s likely to be bought by those wanting an upmarket pickup, the X-Class has heavy duty components under its boldly styled skin. It’s a large vehicle and shares many out of sight components with the Nissan Navara range. The big Merc has a length of 5340 millimetres, width of 1920 mm and a height of 1819 mm. A poor feature is the huge turning circle of 13.4 metres, probably the result of fitting a larger body over the Nissan underpinnings. The width between the wheel arches means it can accept an Australian size pallet. X-Class can take a payload of up to 1.1 tonnes and tow up to 3.5 tonnes. The Merc has a double wishbone front axle and a rear multi-link solid axle in the interests of decent ride comfort, don’t expect it to equal its sedan brothers but we are told it’s not as far removed as you might expect. New X-Class is the only vehicle in the class currently capable of earning a five-star ANCAP rating in all models. Even more importantly is its ability to avoid a crash thanks to the use of Autonomous Emergency Braking and also has Lane Keeping Assist. Both are ideal features for doing their best to protect us from the ever increasing number of inattentive drivers on Australian roads. 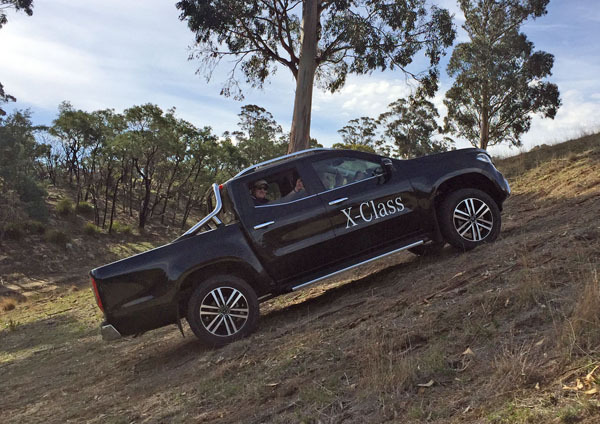 The X-Class Pure is the workhorse of the range – well, sort of. It has 17-inch steel wheels, Halogen headlamps, Electrically adjustable door mirrors, air conditioning, seat in black Tunja fabric, plastic floor covering, Audio 20 CD infotainment system with 17.8 cm ( 7”) TFT and touchpad. Next up the line is the X-Class Progressive. Added features are, front and rear bumpers painted in the vehicle colour, 17-inch alloy wheels, electrically adjustable and heated door mirrors, windscreen with heat insulating glass and automatic wipers. Inside there’s Garmin Map Pilot navigation, Carpets, seat upholstery in black posadas fabric, steering wheel, shift lever knob and handbrake lever in leather, door sill panels in aluminium and illuminated front footwell. Top of the line is the X-Class Power. Visually it has chromed underbody panelling in front bumper, a chromed rear bumper, 18-inch alloys, LED lights front and rear. Inside, the Progressive has an instrument panel with upper section in Artico man-made leather including contrasting topstitching, Ventilation outlets galvanised in silver shadow, the Mercedes COMAND Online multimedia system, Electrically adjustable front seats with lumbar support, Automatically dimming inside mirror, with a compass in the mirror. 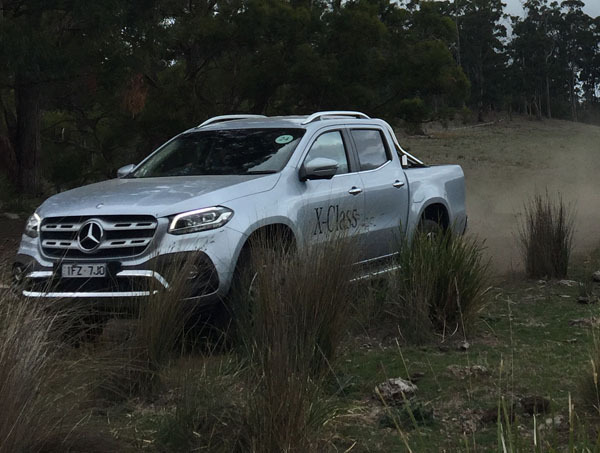 We’ve yet to carry out a road test on the all-new Mercedes-Benz X-Class pickup but will arrange one soon and get back to you with our thoughts.